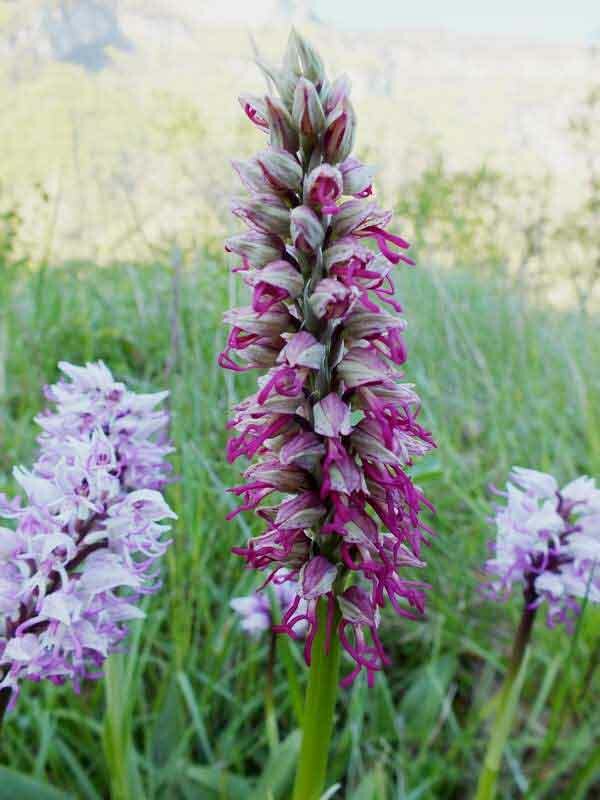 To find a recognisable orchid hybrid in the wild is exciting, but they are sometimes difficult to identify accurately because, even in relatively small groups of hybrids with the same two parent species, there can be considerable variation in the shape, size, and most confusing of all, lip pattern and form of the flowers. Another factor which can affect identification is that both parent species may not be close to the hybrid - for example because plants have failed to flower that particular year or one species recently become locally extinct in the vicinity of the hybrid plant. Above: hybrid between Man Orchid Orchis anthropophora and Monkey Orchid Orchis simia. This plant was photographed on a roadside verge in the Vercors in France, and only Monkey Orchids were in close proximity. 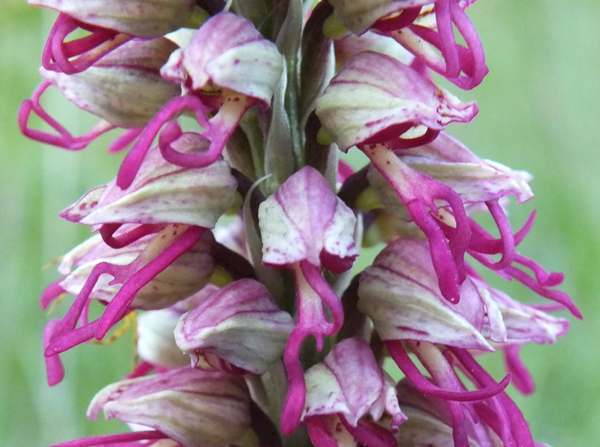 The hybrid between Man Orchid and Monkey orchid has only been recorded once in the UK in Kent in 1985. There is a suspicion that that hybrid could have been the result of hand pollination. In Europe this hybrid is a relatively common occurrence where both plants are present, and we have seen numerous examples during our extensive travels in France. The plants display typical hyrbid vigour and are much taller than normal Monkey Orchids and more robust-looking than typical Man Orchids. A fairly common characteristic seems to be the deep vibrant pink lips of the hybrid plants compared with the much paler lips of the Monkey Orchid. Above: 1 - Monkey Orchid. 2 - Hybrid between Man and Monkey orchids. 3 - Man Orchid. The photographs on this page were taken in France.